All of our 10 Line Cards are completely random. There are over 3.6 million different combinations available. No matter how many cards you order, it is very unlikely that you will receive a duplicate card. 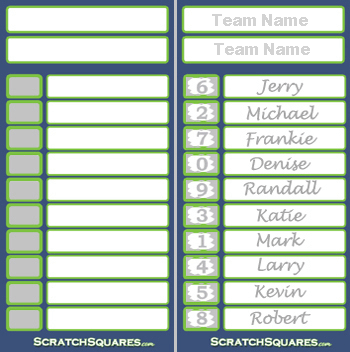 With a little creativity, the 10 Line Scratch Cards can be used for a wide range of sporting events, such as any football, basketball, baseball, or hockey game. They can also be used for UFC, Boxing, Golf and even Nascar Racing. Click on the sport of interest on the right side of your screen for ideas on ways to use these for each sport. 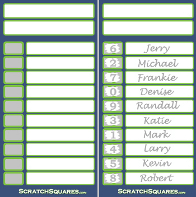 These scratch cards are perfect for quick and easy pools with 10 people or less. 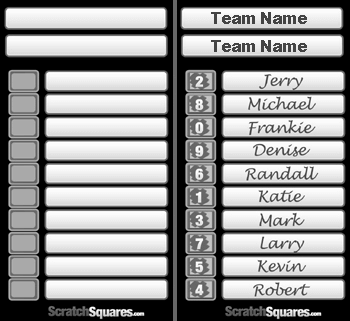 To start your pool, write in the names of the two teams that will be playing, then have the participants of the pool write their name on the line or lines of their choice. Once the lines are full, simply scratch off the covering to reveal the numbers. 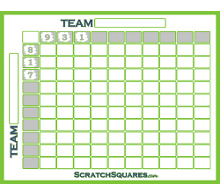 When using these for football, baseball, basketball, and hockey you will add the scores of both teams together and use the last digit of that total. To use these for a Boxing or UFC event you can use the round or the second the fight ends. For golf you can use the number of strokes over/under par the winner was. For Nascar you would use the last digit of the starting position of the race winner.